Modern Architecture and Affordability – A Contradiction? 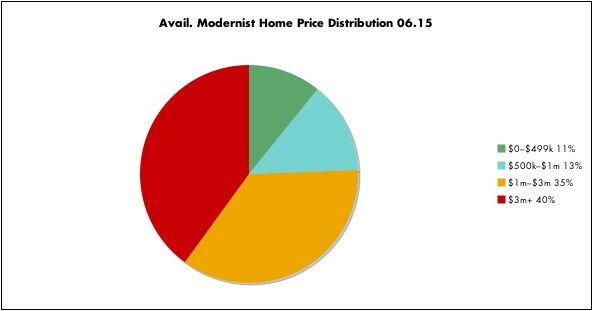 Distribution of asking prices for modernist homes in Southeast Florida, June 2015. Source: Tobias Kaiser/Kaiser Assoc. Following the market for modernist homes in Southeast Florida for over 12 years, I noticed a significant shift in the price distribution of modern homes available for sale. That translates into a massive drop of 22 percent and 38 percent in the two price brackets under $1m, and a stunning 80 percent increase in asking prices above $3m (not adjusted for inflation et al). Aha – now you think: "great for you real estate agents and brokers". Contrary to common belief, upper market demand is small in numbers and does not constitute the majority of market activity. Most requested are modernist homes up to $600,000. But there is hardly any modernist inventory for resale at this price range, and because of the high land cost in SE Florida, new inventory below circa $1m is often located in areas that turn off most buyers. Sellers of affordable modern homes and imaginative builders: step up to the plate – I am ready to take your call now.